This product will not work in USA, Canada, Japan and other countries with 100-120V, unless you are using a step-up converter. 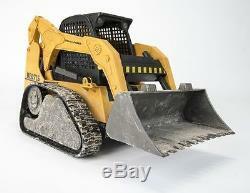 Carson Hobby Line RC 1:12 Compact Track Loader 2.4 GHz 500907208 Genuine New. The CARSON-MODEL SPORT compact track loader from the Hobby Line is fully functional. 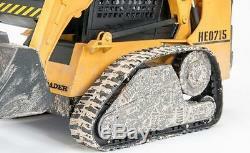 Thanks airbrush painting of small tracked excavator it shows like it has dirt from the job site. Powerful electric motors provide propulsion in rough terrain, turn the excavator at the site, reduce and lift the dipper arm or tilt the blade. When driving lights headlights and taillights. The interference-free 2.4 GHz remote control controls all functions of CARSON Compact Track Loaders proportional. 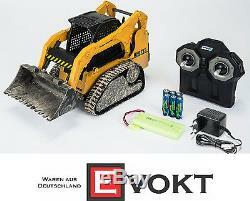 Drive battery, wall charger and transmitter batteries are included for instant fun. Technical details: - 2.4 GHz RC system - chain drive - dipper with overload protection (slipping clutch) - 7.2 V / 800 mAh NiMH Battery - 4-channel RC - front and rear light when driving - chains controlled individually - remotely controllable functions: speed forward / backward, turn left / right, turning on the spot, bucket arm up / down, scoop up / tilt - plug charger 200 mA charge current. Scale 1:12 Length 325 mm Width 165 mm Height 187 mm Weight 1200 g. Safety note: Not suitable for children under 14 years. The packaging must be kept because it contains important information. Please read our terms and conditions before purchasing from us. All packages are Trackable and will require proof of signature upon receiving. Please note that our products are coming with European Sepcifications and/or with European 2 PIN plug. The item "Carson 112 track loader premium 2.4 GHz 100% RTR set ready to go" is in sale since Friday, May 27, 2016. This item is in the category "Toys & Hobbies\Radio Control & Control Line\RC Model Vehicles & Kits\Industrial & Service Vehicles".